A Labour MP is to be investigated for remarks about the party's handling of anti-Semitism but will not be suspended amid a deepening row within the party. Chris Williamson claimed Labour had "given too much ground" in the face of criticism over the issue, remarks which he now says he "deeply regrets". Deputy leader Tom Watson criticised the "heavily caveated" apology and said stronger action was required. The MP remains a member of the party in Parliament during the investigation. Labour has put the MP under "formal notice of investigation" over a "pattern of behaviour" relating to the long-running row over anti-Semitism. The BBC's Vicki Young said the MP faced possible expulsion as the ultimate sanction but would remain a member of Labour's parliamentary party while the probe took place - a decision likely to anger many within the party. In footage published by the Yorkshire Post, Mr Williamson, who is a close ally of Jeremy Corbyn, told activists Labour had been "too apologetic" over anti-Semitism and was being "demonised as a racist, bigoted party". Mr Williamson is reported to have held a meeting with aides of Jeremy Corbyn's shortly before Prime Minister's Questions began at midday. Minutes later, he issued a statement on Twitter apologising, saying he never meant to downplay the "pernicious and cancerous" nature of anti-Semitism. "I deeply regret and apologise for my recent choice of words," he wrote. "I was trying to suggest how much the party has done to tackle anti-Semitism. "Our movement can never be too apologetic about racism in our ranks. While it is true there have been very few cases of anti-Semitism in Labour, something I believe is often forgotten when discussing this issue, it is also true that those few are too many." Mr Williamson said he would be more "considered" in his language in future and said he wanted to be "an ally" in the fight against anti-Semitism. Labour had urged the MP to say sorry for the "deeply offensive and inappropriate" remarks made clear that "downplaying the problem of anti-Semitism makes it harder for us to tackle it". But senior figures say Labour must go further and take disciplinary action, ex-leader Ed Miliband describing the row as "a test" for the party. Mr Watson said the MP's statement was "not good enough and if it was in my gift I would have removed the whip from him already". 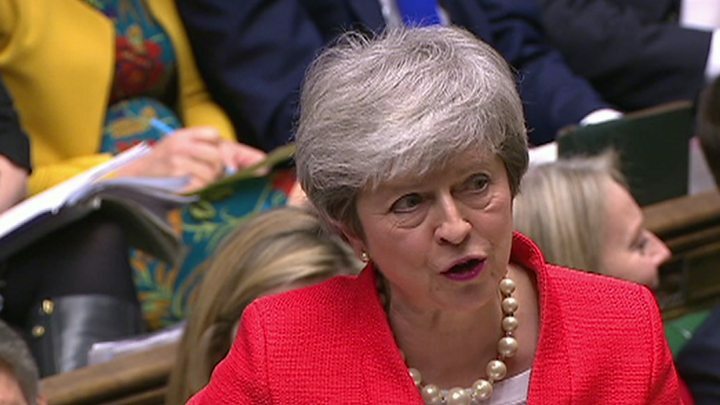 Urging Labour to suspend the MP, Theresa May said the fact Jewish MPs like Luciana Berger felt they had no choice but to quit Labour while Mr Williamson stayed put "summed up" the state of the opposition. "It tells you all you need to know about the Labour leadership," she said at Prime Minister's Questions. "Present but not involved." London Mayor Sadiq Khan told the Emma Barnett show on BBC Radio 5 Live that Labour needed to get its house in order through "swift, robust action" against offenders. Board of Deputies of British Jews president Marie van der Zyl has also called for the removal of the whip from Mr Williamson. She said the board rejected his "half-hearted apology" and had submitted a formal complaint to the Labour Party. "Jeremy Corbyn must remove the whip at once if he wants to retain the faintest image of himself as an anti-racist," she said. Labour has struggled to contain a long-running row over claims of anti-Semitism - hostility or prejudice directed against Jewish people - within its ranks. Nine MPs quit the party last week, criticising the leadership's handling of the issue. But at a recent Momentum meeting in Sheffield, Mr Williamson said "I have got to say I think our party's response has been partly responsible for that because in my opinion… we have backed off far too much, we have given too much ground, we have been too apologetic." Amid applause from the audience, he went on to say: "We've done more to address the scourge of anti-Semitism than any political party." On Tuesday, Labour officials criticised Mr Williamson for booking a room in Parliament for a screening of a film about anti-Semitism and the activist Jackie Walker. Ms Walker was suspended by Labour over allegedly anti-Semitic comments in 2016, and the documentary, Witch Hunt, looks at those and other allegations within the party. Earlier this month, the Labour Party's general secretary, Jennie Formby, said the party had received 673 complaints in 10 months alleging acts of anti-Semitism by its members.